Wake up to the smell of ocean air, chirping sounds of Mynah Birds and Red-Vented Bulbuls at one of Kihei's first class luxury communities. Just steps away from the Pacific Ocean, this is the perfect setting for your dream home. Surrounded by lush tropical landscape, these trees and plants are home to many species of birds. This resort area spans 23 acres and is surrounded by lush tropical gardens. Maui Kamaole overlooks a magnificent ocean bay and some of the best sunset views you can enjoy right from your own private lanai. With two tennis courts, two swimming pools, spas and the convenient access to Kamaole Beach III makes this the perfect location to live. Take in a day at the beach with swimming, snorkeling, volleyball, surfing or simply sunbathing with a book. The water is so clear you can see fish such as the Trumpet and Yellow Tang swimming right below you. Walk across the street to Kamaole III beach park. put on your snorkel mask and take a swim with the Parrot Fish. Kamaole beach III is a beautiful soft white sand beach with a gorgeous tropical landscape. The properties at Maui Kamaole are located within viewing distance of Molokini which has some of the best diving around the island. We are also close to renowned golf courses, high end dining and shopping at The Shops at Wailea. There are an array of public beaches nearby, each one unique and beautiful. We invite you to relax and settle into a one of a kind tropical paradise and make Maui Kam your own. Maui Kamaole condominiums are located between Hale Kamaole and the Maui Hill Resort in South Kihei at 2777 S Kihei Road. Kihei, Hawaii 96753. 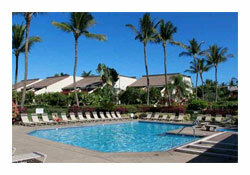 For a complete list of Maui Kamaole Condos for Sale, click here.